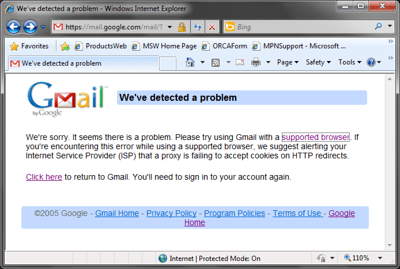 First thing today I started up Internet Explorer to view Gmail. I’m sure this is just some fluke but couldn’t help but get a laugh out of this message. IE somehow was found to be an unsupported browser. That’s just funny on so many levels. This entry was posted in Funny Bits and tagged IE, internet explorer on July 19, 2010 by Adron.